Hello! It was so good to hear from you! I had a little trouble reading your name - is it Denish? I really liked your drawings of rabbits on your last postcard. You will have to tell me more about why they are so important to you, I am very interested to know! I hope you have enjoyed some of my postcards so far. A lot of things I have written about involve my family because I am very close to them. I am excited to learn more about you in the near future! My greatest strengths I would have to say are my loyalty to others, my compassion, my ability to understand people and the way I love those who are close to me. I live my life with my heart on my sleeve. I have trouble hiding my emotions, whether I am happy, sad, frustrated, in love, stressed out or excited. Anyone who knows me knows that they can tell what kind of mood I am in just by looking at me. I take pride in my ability to understand people and be compassionate when they are hurting or in pain. I am also a very loyal friend, sister, daughter and girlfriend. I believe that trust is the foundation for all good relationships. When I love someone, whether it is a boyfriend or a family member or a friend, I do it with my whole heart. I love deeply and honestly, and consider myself very lucky to have loved so many people in my life. 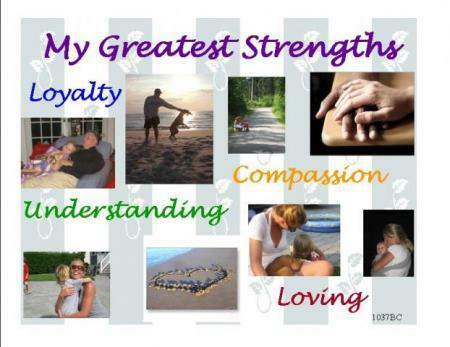 I look forward to hearing all about your strengths! Talk to you soon!